Today’s Final Jeopardy answer (in the category Presidents: Born & Died) and game statistics for the Friday, June 1, 2018 game between Dan Hess, Ian Booth, and 3-day champion Jeffrey Schwarz. Today’s Final Jeopardy answer (in the category Currency) and game statistics for the Thursday, May 31, 2018 game between Skyler Kelemen, Maryanne Theyerl, and 2-day champion Jeffrey Schwarz. Today’s Final Jeopardy answer (in the category American Composers) and game statistics for the Wednesday, May 30, 2018 game between Amy Cuzzolino, Amanda McClendon, and 1-day champion Jeffrey Schwarz. Virginia Cummings returned on Monday as Jeopardy! champion; see who joined (or will join) her on the show this week! 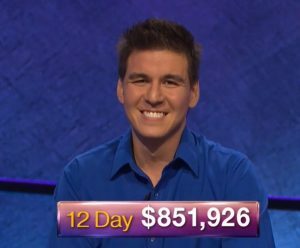 Today’s Final Jeopardy answer (in the category British Commonwealth Countries) and game statistics for the Tuesday, May 29, 2018 game between Tim Young, Jeffrey Schwarz, and 2-day champion Virginia Cummings.